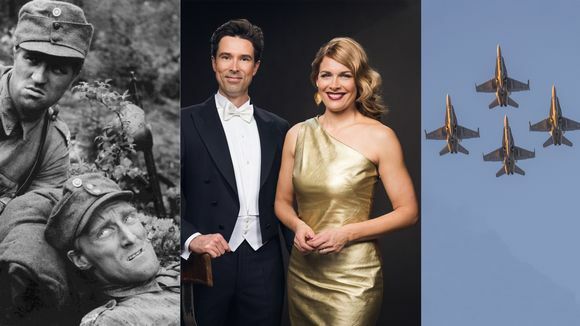 Finland's 100th Independence Day offers a packed schedule of events, many of which Yle is carrying live on the web, TV and radio. The day's festivities began at 9 am with a flag-raising ceremony on Helsinki's Tähtitorni hill. Speaking at the event was Sampo Terho, Minister for European Affairs, Culture and Sport and chair of the new Blue Reform Party. The main military event is a march-past in the eastern town of Kuopio, streaming on Yle Areena beginning at 1.10 pm. An ecumenical church service began at noon at Helsinki's Lutheran Cathedral, and is being screened on TV1. The sermon is by Lutheran Archbishop Kari Mäkinen. Assisting are Orthodox Archbishop Leo, Roman Catholic Bishop Teemu Sippo, and Hannu Vuorinen, President of the Evangelical Free Church of Finland. Also on hand are the Cantores Minores boys' choir and the Viva Vox chamber choir, with President Sauli Niinistö and other dignitaries in attendance. Also beginning at noon is the annual TV broadcast of Edvin Laine's classic 1955 war movie The Unknown Soldier, based on the novel by Väinö Linna. Beginning at 6.55 pm, Yle's TV1 begins broadcasting the Independence Day Ball at the Presidential Palace, with coverage of after-parties starting at 10.20 pm. The theme of this year's ball is a meeting of the generations, with Finns of all ages on the guest list.